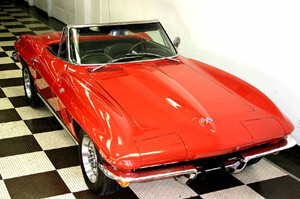 This GEORGEOUS mid-year Corvette convertible is extremely clean and solid. EVERYTHING IS LIKE NEW. ((( FRAME-OFF))) restored around 7 years ago and still in great condition with very few miles. 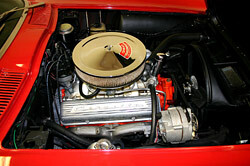 The tired old 300hp 327 engine was replaced by a strong running 350/350hp 4-bolt main with 9:1 compression. It runs great and looks stock. The factory 2 1/2" exhaust system sounds really healthy without being loud. It has power steering and 4-wheel disc brakes. muncie 4- speed tranmission. Completely rebuilt suspension and with upgrades: stainless brake calipers, stainless fuel and brake lines, stainless parking brake components, etc. 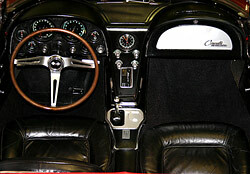 1965 CHEVROLET CORVETTE, The front rotors and pads are new, the as well as a new clutch. The radiator is an original aluminum Harrison from GM. This is a true red car originally with white vinyl, now it is black leather. The white top looks great on a red car. WE HAVE PICTURES OF THE FRAME OFF IN PROCESS (frame painted inside and out with POR 15).